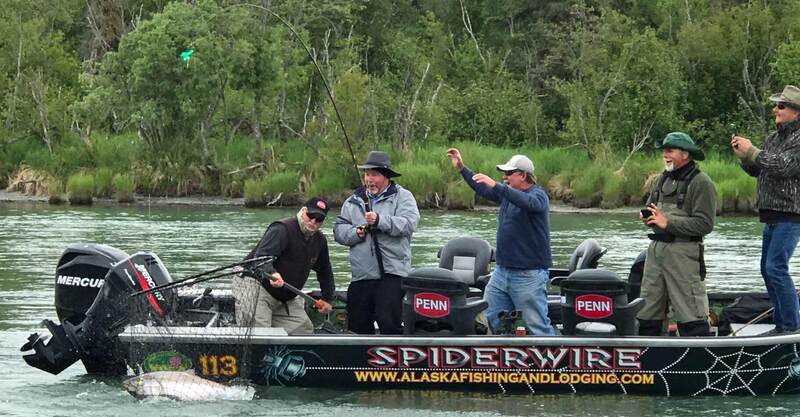 The Berkley Boat – This is a 1990 Willie Predator, which was the very first Willie Boat on the Kenai River. At the time this was Willie’s prototype with 11/32 24″ sides making it a very light boat. The SpiderWire & Penn boat – This boat is a 1998 Willie Predator. All of our Willie Boats are 20′ long and 8 1/2 feet wide on the floor. Our Newest Boat – A new addition to our fleet this year will be wrapped with our Alaska Gold Prospecting colors. It also is a 20 foot by 8 1/2 wide fully loaded river boat equipped with all the new items. The Alaska Spirit The newest addition to our fleet, is the Alaska Spirit. It’s wider platform and deeper “V” hull gives added stability and performance in the salt water. The Spirit is a 30 foot Aurora with twin Honda 200hp – 4 stroke motors. This boat get your to the fishing grounds fast and safe. All of our boats have all the Safety Equipment and are coast guard certified They are set up for safety and comfort.